The much awaited sequel of bestseller The Selection..... there is conflict abound in the game. 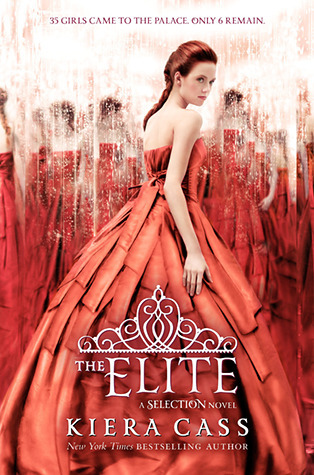 Presenting The Selection #2 The Elite by Kiera Cass. Thirty-five girls came to the palace to compete in the Selection. All but six have been sent home. And only one will get to marry Prince Maxon and be crowned princess of Iléa. Man this is going to be one big review..... The Elite, hotly anticipated and much awaited sequel to last year's, The Selection. 6 girls left now, 6 Elite girls and America wants more time, Maxon wants more time.... but time is not a leisure commodity as the elimination draws nearer and Maxon needs to choose the One..... But America is confused and she hesitates and sputters and things happen that lower her confidence even more making her question herself. Maxon knows what he wants and who he wants but its is America who must decide that is living a simple life with Aspen worth it or can she be the one for Maxon towards whom her attraction grows day-by-day. As far as the originality of the plot is in question. It is ingenious of Cass to mix both post-apocalyptic and the premise of a reality show, The Bachelor (called Symbar in India) for a dystopian society ruled and governed under ranks of class. Come on WWI & WWII have already happened in the past but WWIV is a much more horrifying prospect to imagine. The plot and the writing is very well done as always, simple, straight-forward and with very good pacing maintained throughout. This time around the onslaught of drama has streaked up a degrees more. The race is nearing the finish line, only 6 girls left, 6 possible candidates and the time for playing nice is over. And as far as the characters go they are well apt at upping their game. As for me i'd say reality shows like these while romantic and highly dramatic are immoral. Yes the center of attraction(bride or groom) needs to choose the perfect one. The person in question shower attention equally to every candidate is rather hurtful to watch is the opposition has genuine feeling. Yes these types of shows only serve to up the viewer rate if a channel and raise controversies in the media..... These things are the customs of a time gone past and not agreeable for the current era..... BUT COME ON I CAN MAKE AN EXCEPTION FOR KIERA CASS' BOOKS. I'd like to applaud Ms. Cass on her ability to work her magic on her characters so much that what they do and what we them do has the capacity to make us love them, swoon over them, cry with them, and even make us hate them for their actions. Now let me connect the dots. I didn't like Aspen in Selection and absolutely didn't like him in Elite as well. It is understandable he wants America back after the mistake he made of leaving her. He comes of as a forceful personality, exerting his presence around America when it is visible it is not needed even if he was her rock throughout the events of this book. All America needs is room to think for herself which is not possible with the pressure of the Selection, Aspen being assigned her guard and her growing attraction to Prince Maxon. She feels insecure. With being the only lowest caste candidate, she hesitates to choose. On one hand the safe choice of Aspen, her childhood sweet heart and on the other hand is the difficult one Maxon, who comes packaged with a whole kingdom. Maxon on the hand is just full of surprises. In a position of public importance you tend to develop a thick skin and the handsome Prince does that pretty well but he cares too. He doesn't show it but he cares a lot about everyone and loves all the selection candidates in his own way. "A new breathless romance vs. the lure of the safety net, America finds herself in a bind...... The Elite, of drama, romance, remembrance, secrets revealed and trust lost. Perfect Ms. Cass simply perfect and a simple and dramatic read. The One better come out soon we are hungry for some results"
I'm so glad that you liked it! I read the first one and loved it but haven't had the time to read the second. Hopefully I will be reading it soon!